INTRODUCTION The blue nevus was first described by Tieche in 1906. It gets its name from its blue color that results from the concentration of melanin in its location in the deep dermis and the Tyndall effect of differential absorption of long wavelengths of light. It is believed to represent dermal arrest in embryonal migration of neural crest melanocytes that fail to reach the epidermis. The blue nevus is composed of pigmented dermal melanocytes and is represented by two histolog-ic types: the common blue nevus and the cellular blue nevus. These two variants can sometimes be differentiated on clinical appearance. LAMB syndrome is the association of blue nevi with lentigines and skin papules and underlying atrial cardiac myxomas. HISTOPATHOLOGY The common blue nevus is characterized by elongated melanocytes present between collagen bundles of the mid and upper dermis. Melanophages contain much of the pigment present in these lesions. DIFFERENTIAL DIAGNOSIS The differential diagnosis includes cellular blue nevus, dermatofibroma, oculodermal melanocytosis, malignant melanoma, pigmented basal cell carcinoma, Kaposi's sarcoma, and vascular lesions. TREATMENT Treatment is not necessary as long as the diagnosis is assured. If there is any change in pigmentation a biopsy should be performed. When removal is desired for diagnosis or cosmesis, simple surgical excision is recommended. 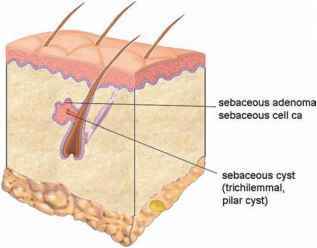 It is important to include deep subcutaneous tissue because these nevi often extend into the subcutis. Dorsey CS, Montgomery H. Blue nevus and its distinction from Mongolian spot and the nevus of Ota. J Invest Dermatol 1954; 22:225-236. Haye C, Dhermy P. Blue nevus of the eyelid. J Fr Ophtalmol 1978; 1:73. Mishima Y. Cellular blue nevus: melanogenic activity and malignant transformation. Arch Dermatol 1970; 101:104-110. Rodriguez HA, Ackerman LV. Cellular blue nevus: clinicopathologic study of forty-five cases. Cancer 1968; 21:393-405. Silverberg GD, Kadin ME, Dorfman RF, Handberry JW, Prolo DJ. Invasion of the brain by a cellular blue nevus of the scalp: a case report with light and electron microscopic studies. Cancer 1971; 27:349-355. How deep are basal cell nebiu? Can blue nevi occur later in life? Can blue nevus be malignant?